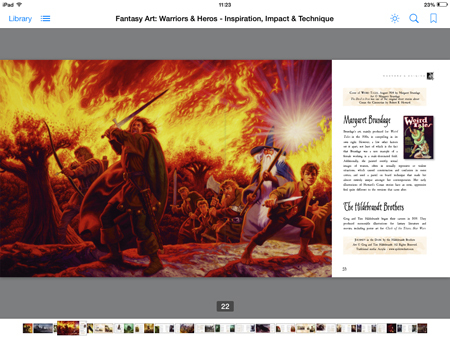 This is an incredible illustrated ebook in the Fantasy Art series, ideal for iPad. 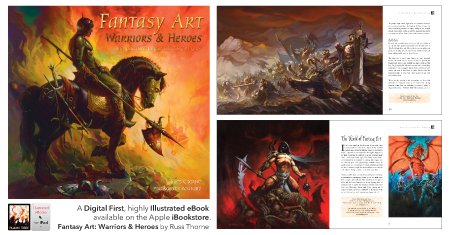 Warriors & Heroes, by Russ Thorne, with foreword by legendary artist Ken Kelly, is a stunning display of incredible, contemporary fantasy artwork, a complement to its bestselling predecessor, Dragon Art. 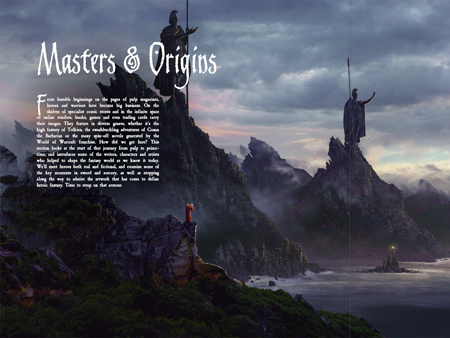 The first section covers 'Masters & Origins' and introduces some of the writers, characters and artists who helped to shape the fantasy world as we know it today – including James Allen St John, Roy G. Krenkel, the Hildebrandt Brothers and of course Frank Frazetta. A fascinating discussion of warriors and fantasy art follows on, running throughout the book, accompanied by a large selection of works by the best of the current crop of fantasy artists, such as Brom, Martin C. Hayes, Alex Horley, Jason Juta, Alan Lathwell, Jason Engle, Lucas Graciano, Adele Lorienne and many more. The majority of the recent work that features in the book was created in digital media, reflecting the use of the most up-to-date methods. Warriors & Heroes is also interspersed with features on artists' works-in-progress, providing invaluable insight on techniques and tools. 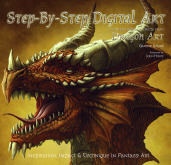 It is a feast of visual imagination and a must for all fans of fantasy art. Best viewed on an iPad with a retina display: it's a large book but it's worth it! Ken Kelly is a long-established and successful fantasy artist. He’s been drawing since he was knee-high and hasn’t stopped since, getting his break into the industry after showing his work to his Uncle Frank (Frazetta), who got him in touch with Warren Publishing for his first assignment. The power and dynamism of Frank’s style can be felt in Kelly’s work, which covers a wide range of warriors and heroes, including Conan the Barbarian and Tarzan, as well as many album covers for rock bands such as KISS. See what Ken Kelly's up to now – including painting Gene Simmons' basses! The beautiful colour illustrated ebook is available through itunes here. Check out the reviews for predecessor title Dragon Art here. We have other illustrated ebooks, including Dragon Art, Gothic Art, see our Fantasy Art Pinterest Board.